At first, I wish you all dear readers a wonderful year 2019! Today, to begin this new year, I would like to explain to you an experience that I lived by doing a hypnosis session with a hypnotherapist very pleasant and very professional! You will find his business card at the end of the article. The reasons I resorted to hypnosis were various, the first was personal, I wanted to find myself in agreement with myself and face some fears that dominated me for a little while. Then, the second was to share this experience with you to reveal the method and the benefits that I felt during this session. A great curiosity also led me to do it, I’m getting bigger and happy! 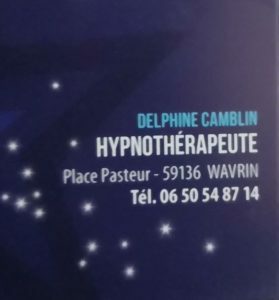 I thank the hypnotherapist Delphine Camblin who gave me time for an interview before the meeting that allowed me to develop this article. Why make a session Why did I decide to go for a hypnosis session? I assure you, this is in no way a hypnosis session as we can see on TV. It is a hypnosis controlled and supervised with the help of a therapist. We all feel hypnosis differently, some people may be very receptive while others less, no rational explanation to date to demonstrate it. My hypnotherapist told me in all humility that only 5% of us are refractory to hypnosis? At first, the session begins with an exchange between the patient and the professional who allows the latter to understand our coming. It is very important for the hypnotherapist to understand why you are there? This is essential for them in building their dialogue. It is obvious that the questions will not be the same for you since the hypnotherapist adapts according to your request and according to your why. The hypnotherapist will use your answers to stimulate you and incorporate new, positive ideas into your subconscious. A link is established with neuro-linguistic programming (NLP) that allows to integrate beliefs leading to the success of a person. Heart coherence. I put you in link below, the video allowing you to work that. The goal here was to reduce my stress and soothe my body to be ready for hypnosis? Then, I settled comfortably under a warm blanket in the armchair, the therapist explained to me that when the body enters the state of hypnosis, its temperature could decrease in a considerable way. I entered hypnosis in a deep and immediate way, so the therapist explained to me the link with my daily meditative practice. During the session, she directed me and asked me to visualize a cloud in which my mission was to put every bad memory, painful experiences that I had lived and leave them in this dark cloud. Then, the sun came gradually to bring light and cheerfulness in my visualization and my imagination. It was very intense because I could feel everything deeply, they allowed me to feel relieved at the end of this session. The purpose of this very rewarding experience was very strong since I felt emotions during this state of hypnosis, I felt a tear that flowed, it allowed me to heal these past experiences and these traumatic shocks which had marked me for several years. The days that followed were quite unstable as I felt relatively emotionally sensitive. I reassure you this step is quickly passed to give place to gentleness and benevolence. In some more serious cases, the person is in multi-consultation with several professionals who seek to find solutions to calm post-traumatic shocks, for example. Hypnosis also has the mission to reconcile anyone with their story, to re-associate the body and mind that often retains the traumatic mind. The problematic, which makes them suffer, prevents people from living properly, ideas are frozen in their brain, causing them to always reproduce the same behaviors and thought process. Hypnotherapy used analytics. This means that the patient has access to unconscious information buried in his brain. It impressed me because I realized that we were far from being aware of everything. The resources of the patient as well as his resistant are useful for introducing new behaviors or beliefs, which means that we are beings endowed with limiting thoughts by beliefs or prejudices. I encourage everyone to try hypnosis if you want to improve or stop any addictions, we are the own consequences related to our internal blockages. Indeed, as we grow up, we accumulate experiences, habits that sometimes pile up and leave no more clarity in our life choices or that imprison us (especially addictions) in repetitive patterns. Therefore, using hypnosis can help us integrate new beliefs and new behaviors into our unconscious to get on the right path. Are you looking for a hypnosis session? a- I invite you to subscribe to the newsletter if you liked this article and this experience shared with you 🙂 you will be able to receive the next articles!